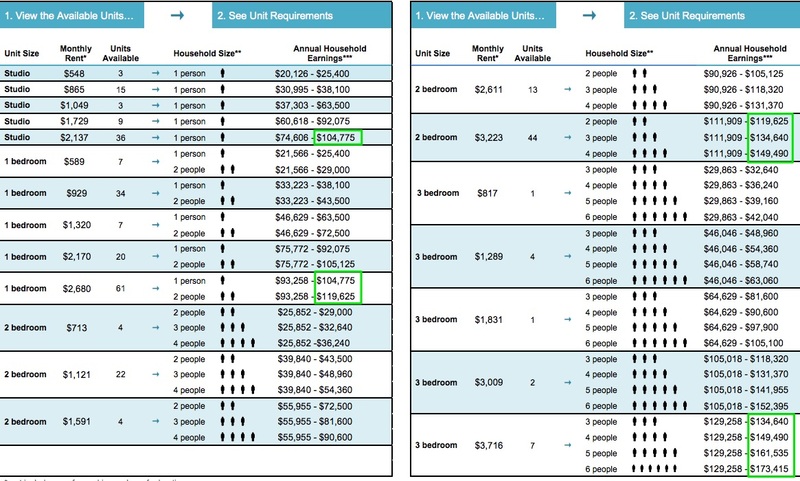 It might be a little easier to find households who meet the income requirements for the remaining middle-income units at 461 Dean and 535 Carlton, since the maximum acceptable income has risen, associated with the annual rise of Area Median Income (AMI). 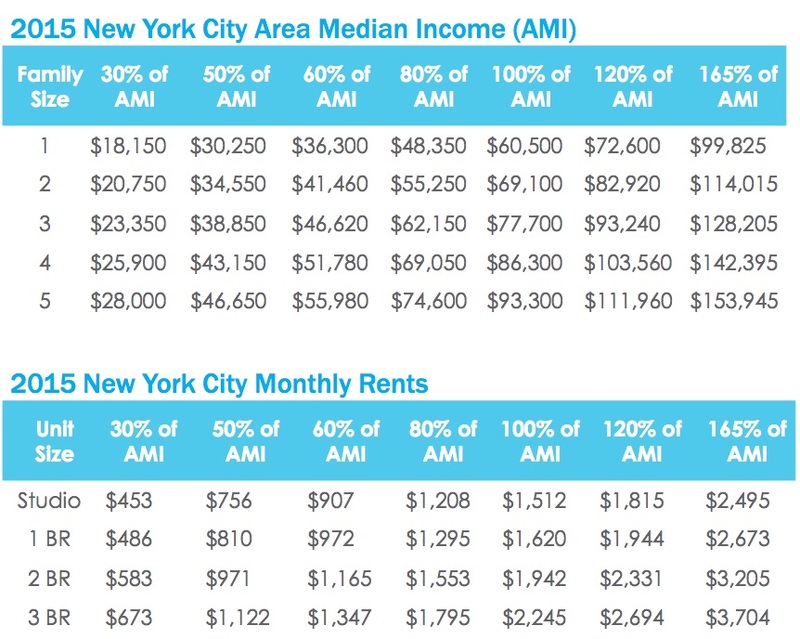 The minimum income in each "band" has remained the same from 2016 and the rents remain the same, but the maximum, set at 160% and 165% of AMI, respectively, has followed the rise in AMI from $90,600 (at 100% of AMI, for a family of four) in 2016 to $95,400 in 2017. 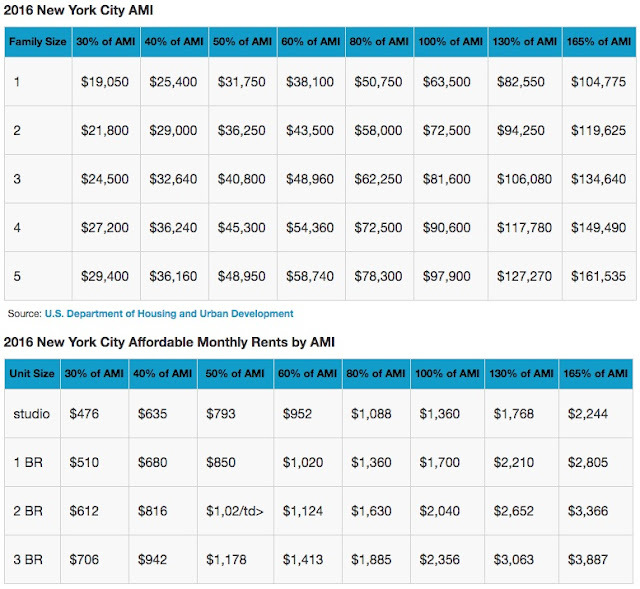 The overall rise in AMI, in fact, suggests that low-income households will find it ever-harder to afford units in projects like Atlantic Yards/Pacific Park even if they win a lottery. 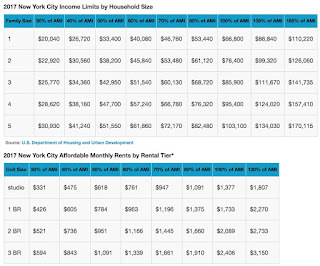 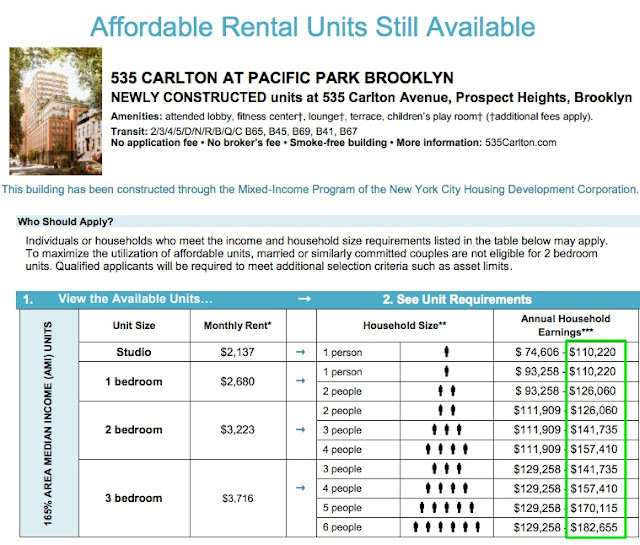 Note--at right and at bottom--that a 2017 document from the New York City Department of Housing Preservation and Development, compared to predecessor documents, omits the rents for units at 165% of AMI, which are decidedly middle-income. 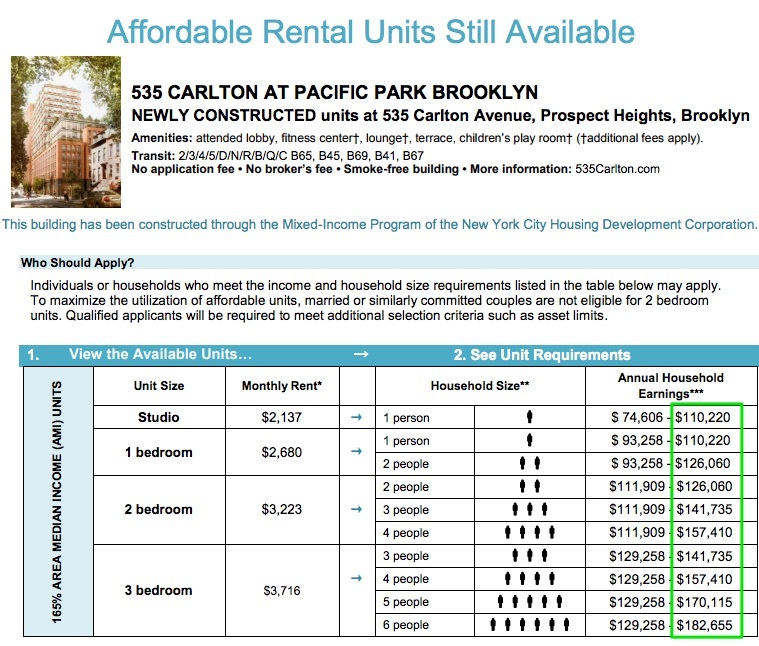 Is that because of recognition that apartments renting for well over $3,000 don't look "affordable," and few actually apply for them? 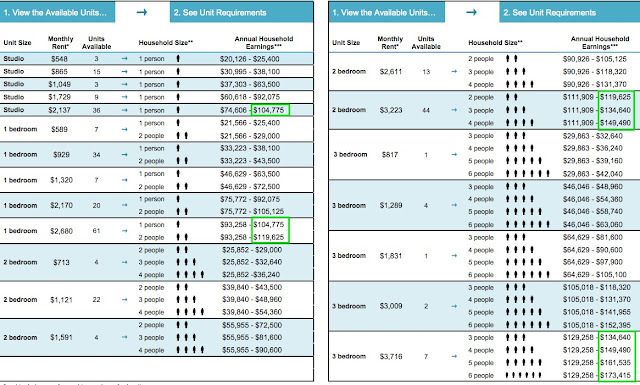 A close look at the new official announcement inviting applicants for the remaining middle-income two-bedroom units at 461 Dean reveals maximum incomes have risen: from $116,000 to $122,240 for two people, from $130,560 to $137,440 for three people, and from $144,960 to $152,640 for four people. 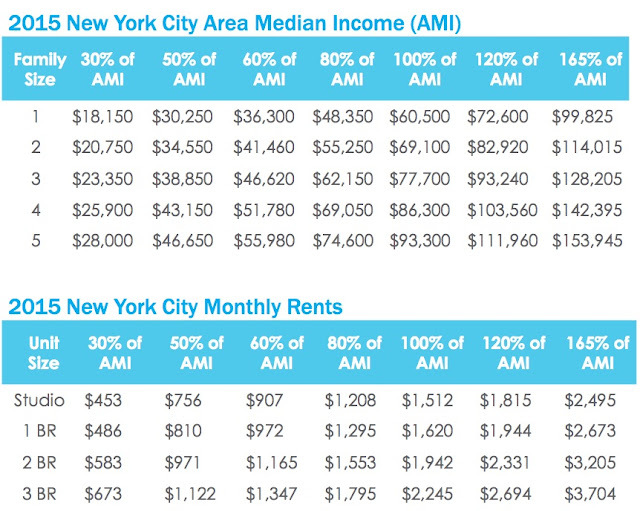 Below, the rise in AMI, with associated rents, via screenshots from HPD.